Aerospace and defence assets employed in MH370 B777 airplane search operation. According to the article, among those 12 countries, they are employing about 32 aircraft (fixed wing), 14 helicopters, 63 boats (ships, destroyer, patrol boats…) and 10 satellites. It goes without saying that before such an operation can be put in place, the assets shall be owned (acquired) by those states, they need to have been maintained, the crews need to have been trained, etc. All those activities and assets, need to have been performed and funded (ideally) in times of peace, when the public opinion is less prone to think that those assets and activities (and the budget directed to provide them) are needed. A second after thought I had reading the article is the continuous need to educate about aerospace. 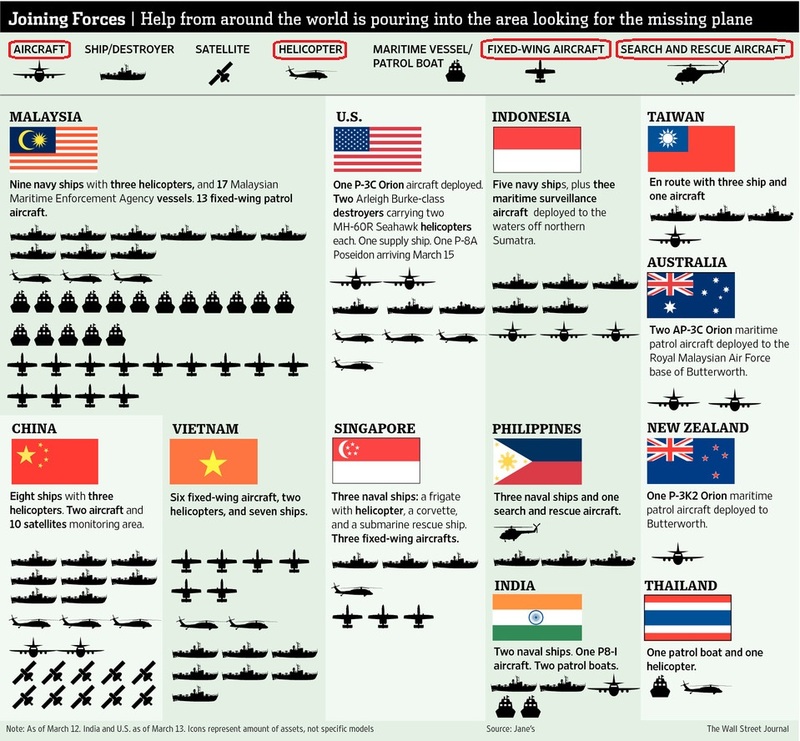 I see (and have circled in red) in the graphic a distinction between “aircraft” and “fixed-wing aircraft“, or “helicopter” and “search and rescue aircraft“. I am aware that the distinction comes not from The Wall Street Journal but from the information source, Jane’s. Jane’s is a well-known publishing group which offers information of aircraft and other warfare, and inventories of those assets owned and operated by different government services around the world (e.g. Malaysian Air Force, Navy, etc.). When Jane’s differentiates aircraft as fixed-wing is to differentiate them from rotary-wing (i.e. helicopters) and not from “aircraft” such as the P-3 Orion or the P-8 Poseidon cited in the graphic, all those are fixed-wing aircraft. Thus, the split between “aircraft” and “fixed-wing aircraft” was unnecessary. When Jane’s differentiates helicopters (or rotary-wing aircraft) as “search and rescue aircraft” is to differentiate them from others but from the operation point of view, thus, “search and rescue” versus “transport”, “attack”, “gunship”… thus, here, again, the split between “helicopter” and “search and rescue aircraft” (SAR) was unnecessary, as the only SAR included in the graphic is another helicopter. I am afraid that a similar confusion has been created when using the terms ship/destroyer and maritime vessel/patrol boat, but since I am not an expert in the field I will not comment. Finally, I wonder where The Wall Street Journal has taken the pictures to symbolize aircraft and helicopters. The icon used to represent the fixed-wing aircraft is a Fairchild Republic A-10 Thunderbolt II, which is indeed a fixed-wing aircraft, but it is a ground attack aircraft (rather than maritime patrol or search and rescue aircraft) only operated by the United States Air Force, not by the Malaysian Maritime Enforcement Agency, Vietnam or Singapore, as the graphic may lead to think.